"Chris Evans, Tom Holland and the casts of both films are global box office stars that provide fans a once-in-a-lifetime opportunity to meet and greet with their favorite super heroes," said Stephen Shamus, President of ACE Universe. "When you listen to the fans, these are the stars that are most requested, so securing the main cast members from both Marvel franchises makes this a can't miss weekend. We also haven't forgotten the WWE fans, some of the most excitable fans in the world." 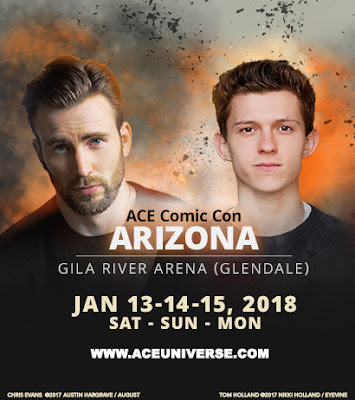 Chris Evans, star of the worldwide hit Captain America movie franchise, and Tom Holland, who portrays Spider-Man in the Marvel hits "Spider-Man: Homecoming" and "Captain America: Civil War" are headlining the new ACE Comic Con Arizona at Gila River Arena, Jan. 13-15, 2018. ACE Comic Con Arizona is a division of ACE Universe, a newly launched experiential events company created by brothers Gareb and Stephen Shamus. With 20 years of experience and 175 Comic Con shows under their belts, the brothers are creating a new immersive experience that looks to redefine the industry and break the mold of the linear Comic Con business. Along with Evans and Holland, other confirmed guests include Sebastian Stan (The Winter Soldier – Captain America), Anthony Mackie (The Falcon – Captain America), Hayley Atwell (Agent Peggy Carter – Captain America), Laura Harrier (Liz – Spider-Man: Homecoming), and Jacob Batalon (Ned – Spider-Man: Homecoming). More guests will be announced soon, including superstars from World Wrestling Entertainment (WWE). VIP Admissions, Photo Ops and Autographs are on sale now at aceuniverse.com. General Admission Tickets can be purchased online at Ticketmaster (ticketmaster.com) starting at 10 a.m. PST on Tuesday, Oct. 10. "When we first went to Gila River Arena, we knew we had found the right home for our next big event," said Gareb Shamus, ACE Universe Chairman and CEO. "We believe the fans will fall in love with this new style of Comic Con and we can't wait for everyone to enjoy everything the weekend will have to offer, which includes the opportunity to watch all of the can't-miss programming on the arena Jumbotron." ACE Universe has secured an exclusive Marvel Comic variant cover to Captain America #495, drawn by Good Charlotte lead guitarist and illustrator Billy Martin. This book is exclusive to box office buyers and VIPs. 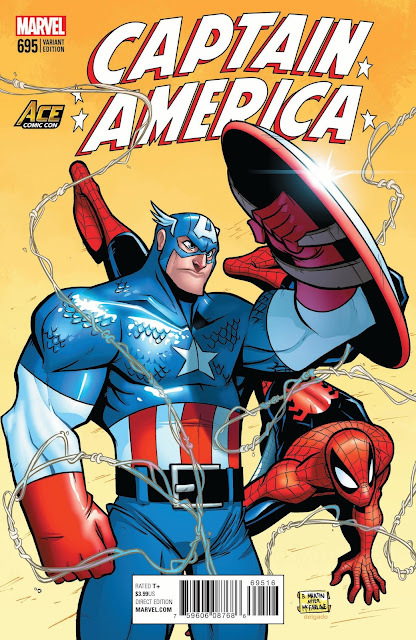 Martin will be on hand all three days to sign the books, which feature Captain America and Spider-Man, in an homage piece of art to the great Todd McFarlane. ACE Universe also has partnerships across key sectors including technology, media, entertainment, gaming, publishers, manufacturers, licensors and retailers to help create a robust experience for fans. Additionally, ACE Universe will be the first to provide FREE global live streaming to fans with wall-to-wall coverage of the entire Comic Con. Now, all fans can enjoy access to top-tier talent, breaking news and on-site programming as every aspect of the show will be fully streamed, social media friendly, and available on mobile devices. ACE Comic Con Arizona is the second of the new ACE Comic Cons, with the debut event set to take place at NYCB Live: Home of the Veterans Memorial Nassau Coliseum in Long Island, NY, Dec. 8-10. In addition to these two shows, ACE Universe will announce more 2018 dates, cities and ticket information at aceuniverse.com and on the ACE Comic Con social channels at Facebook.com/acecomicon or @acecomiccon on Instagram and Twitter.